South African based Micro Aviation is to arm six Bat Hawk light aircraft sold to the Botswana Defence Force earlier this year. FN MINIMI 5.6 mm Mk3 light machine guns (LMGs) that the pilot can fire from a button in the cockpit are to be placed on either side of the pilot cabin on each of the aircraft. Andrew Pappas, Micro Aviation’s owner and founder, said his company would shortly start work in Botswana to arm the six Bat Hawk’s delivered in June this year. Pilots will be able to use one hand to replace the ammunition drum in flight. To Pappas’ knowledge this is the first time the Bat Hawk is being armed. Since 2014, when the Bat Hawk received South African Civil Aviation Authority approval, the Nelspruit based Micro Aviation SA has built about 144 units. Most of the sales have been to wildlife conservation bodies in southern Africa. Apart from six units sold to the Botswana Defence Force, four were also sold to the Botswana Police Service, and four to the country’s Department of Wildlife and National Parks. Other operators of the Bat Hawk include South African National Parks, a number of parks in Mozambique and Tanzania, private park owners as well as wildlife trusts. High visibility from the cockpit, short takeoff and landing distances, its ease of operation, as well as the relatively low initial cost and operating price have allowed the craft to find its niche. 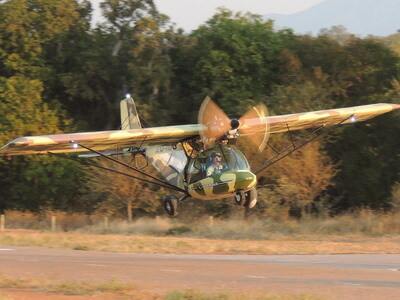 It is designed to replace helicopters in the task of game surveillance and anti-poaching. The cost of the Bat Hawk is currently about R450 000 and its operating cost is R400 per hour, a fraction of helicopter operating costs. The aircraft falls into the Light Sport Aircraft category and has a cockpit that is open at the sides. The aircraft are built in Nelspruit with all airframe parts are manufactured in South Africa. The wings are covered in a heavy rip stop sail-cloth material and the craft uses the Australian manufactured CAMIT 125hp Aero Engine, but a Rotax 100hp engine is available.